New for Fall 2011 is the Marcella collection from Peacock Alley. This yarn-dyed jacquard is expertly woven in quiet tones of ivory and mist and showcases a dramatic damask motif on duvets and shams. Scalloped diamond matelasse coverlet and shams, and Egyptian cotton sheeting with embroidered scalloped edging coordinate beautifully with this ensemble. The Tatum children’s bedding collection from Maddie Boo features a classic and fun combination of green stripes and polka dots on a white background. 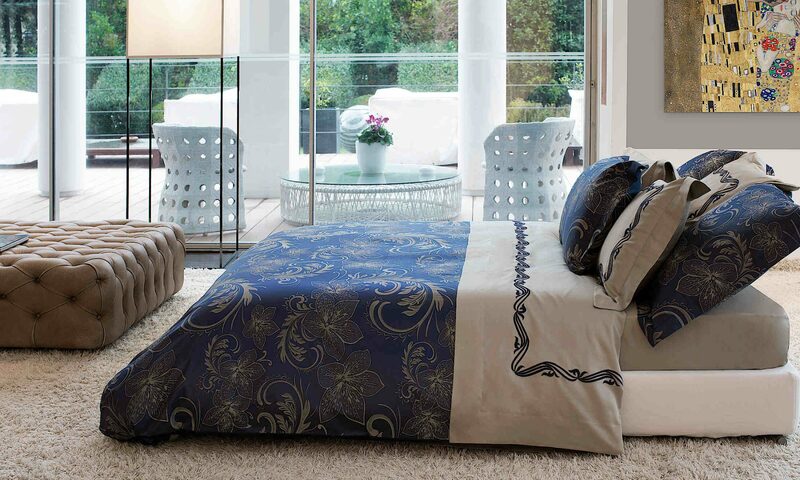 A bedroom with a light and airy feeling and simple decor usually means minimal clutter. So, who knows? Maybe this ensemble will inspire your young lady to keep her room tidy! Wouldn’t that be wonderful? In today’s age of high tech, machines seem to do the work of most everything that once use to be done by hand. These hand embroidered decorative pillows by Kevin O’Brien represent a rare art form that thankfully is still embraced by a small group of artisans. 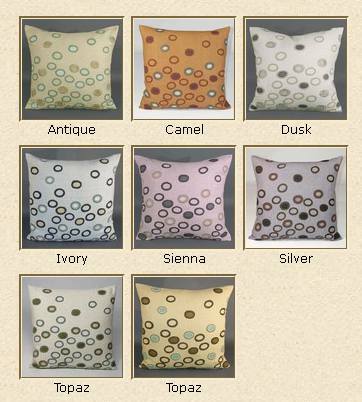 Embroidered on 100% Linen and available in a choice of eight luscious colors, the Crochet Ovals pillow coordinates with any most decor! 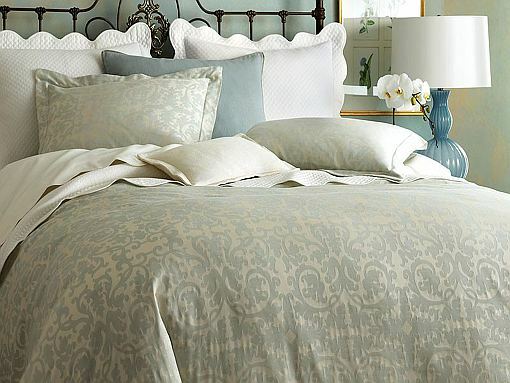 The Peacock Alley Olympia is 100% linen bedding featuring a medallion print in shades of misty blue, taupe and flax. 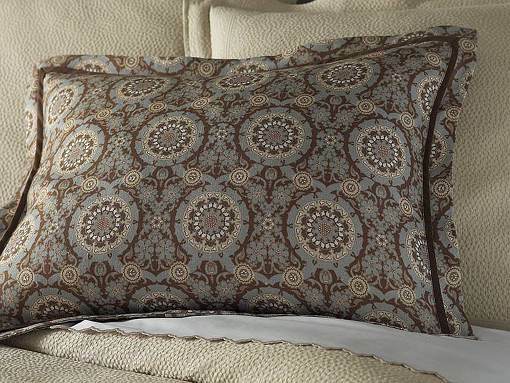 The washable duvet and sham has a wonderful touchable texture and coordinates beautifully with the Peacock Alley Soprano taupe sheeting collection. The ultimate in luxury cushioning! Extremely comfortable and luxurious. 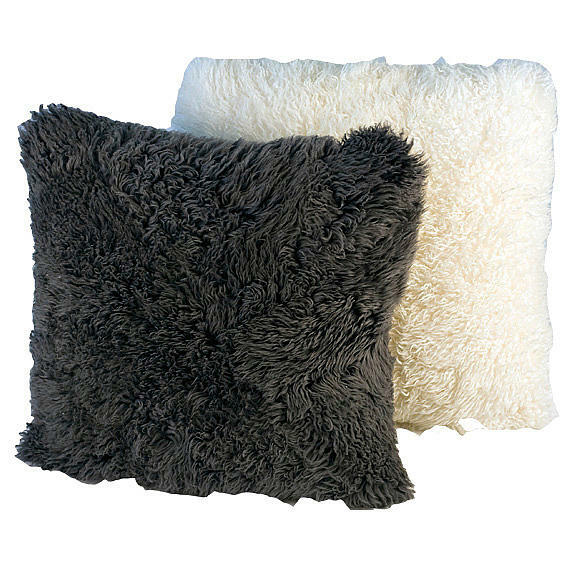 These pillows from Auskin are made with longer wool sheepskins. The natural curl in the wool of the sheep is retained to give these pillows a rough and tumble texture look. 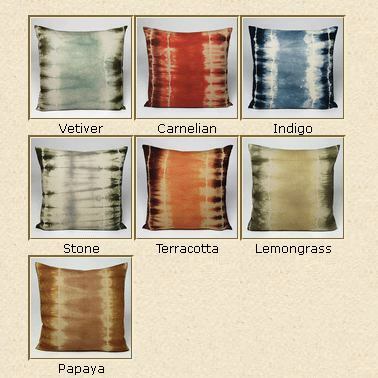 Give your space an artistic touch with these Shirbori pillows by Kevin O’Brien. Made using a Japanese dyeing technique, the unique design and custom colors are a perfect choice for the contemporary home.